Love, love, love…is all you need. 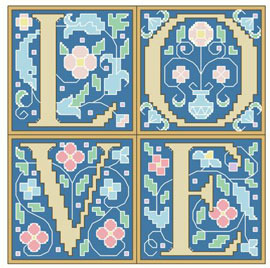 Four gold toned letter blocks spelling LOVE are surrounded by Jacobean style flowers and vines that set them apart and make an elegant emotional statement. Stacked in a square pattern or stitched in a long line, they are perfect for any décor. Contents: Stitch Count 64w X 64h, Finished size on 14ct: 5" x 5"